Ocean fishing without a boat normally involves either casting from a pier or a breakwall or from the beach. Of course, beach casting can be tricky, with the wall of surf rolling in and depending on the tidal position, an angler may or may not be in a position to get a good cast. And that’s allowing for solid beach casting skills. Now, guys who fish are normally guys who tinker but one bait caster has taken that to new heights. So maybe it’s no surprise that a pneumatic cannon was designed to launch a baited line 300 yards into the surf. Manufactured by Bunker Up Fishin’, the Blaster Bait caster uses compressed air to fling bait much further than is typically possible with a rod alone. The inventors claim that the bait caster can fire a frozen piece of bait farther than 300 yards. That’s useful for beach fishermen who want to be able to reach their line out as far as possible. To make the bait launch effectively, it has to be shaped into an artillery round form, and that means freezing. The makers tout the bait caster as ideal to hook into tuna past the break, sail floating lures into a school of frenzied stripers or cast chum for catching sharks from the shore. 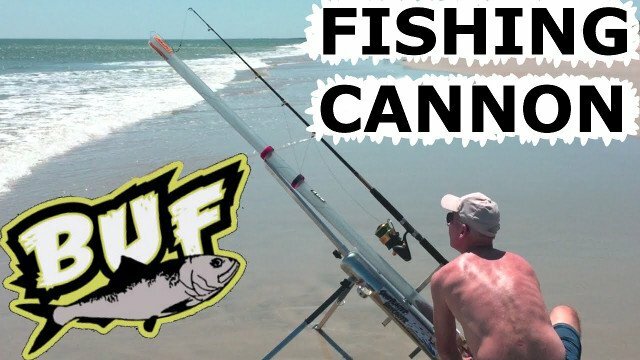 Sure, you can keep fishing the old way, but when there’s an opportunity to combine pressurized air, a cannon, the beach, a cooler full of frozen bait as well some beverages and a fresh breeze, how can any shore locked angler resist? And anyway, a beach cannon will probably also impress the girls. Okay, maybe not. But it’s only $799 during the Holiday season. For a look at how to build your own, click here.